Video above: DPS students from East English Village Academy, formerly the historic Finney High School, walked out Feb. 29 to protest school conditions, along with their teachers. Police maced and brutalized them, and arrested the teachers, just as they did in 2007 when students protested the closure of Northern High School, one of 210 closures that has hit DPS to date. BYE BYE DPS! Former bankruptcy judge Stephen Rhodes dismantled City of Detroit, now will preside over death of DPS. DETROIT— Conveniently turning the spotlight away from the state’s criminal chemical poisoning of the people of Flint, Michigan Gov. Rick Snyder appointed former U.S. Bankruptcy Judge Steven Rhodes the new overseer (with “emergency manager” powers) of what is left of the Detroit Public Schools Feb. 29. Rhodes later told the Detroit Free Press he would appoint an “interim” superintendent to head a school board appointed by Snyder and Detroit Mayor Mike Duggan until elections take place. He recommended elections take place in August. Bills in the Michigan Legislature that would divide the district in two would set the election for November. Rhodes said he would resign in September if they do not pass. WELCOME WHITE DETROIT! 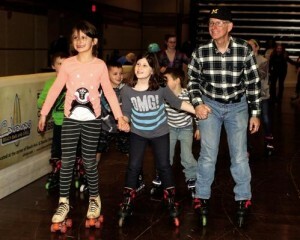 Rhodes roller skates with family in hometown of Cape May, N.J, 5 % Black. 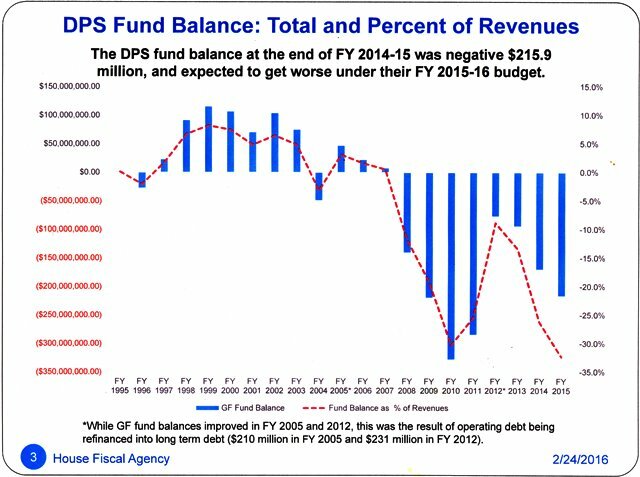 One district would pay off a $1.5 billion DPS debt owed through the year 2040, accumulated primarily under periods of state management since 1999. To pay this year’s allotment of the debt, 66 percent of the district’s state per-pupil aid would be used. The other “debt-free” district would run a schools system tailored to incoming city residents being courted by Rhodes and Duggan, not to the majority-Black students left after state managers closed two-thirds of the district’s schools. “We also have to understand that in the context of school capacity, that our goal here is to compete with the charters,” Rhodes told the Free Press. 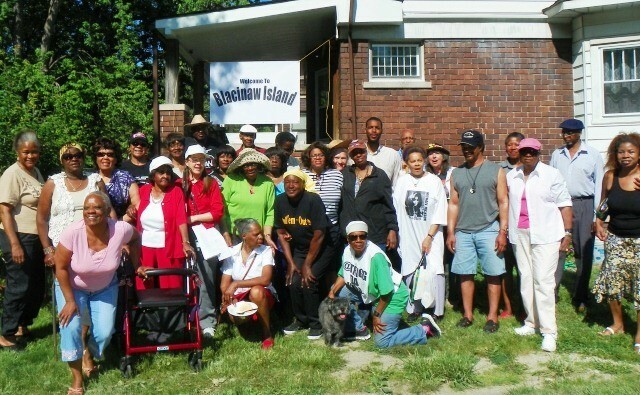 Agnes Hitchcock (center in yellow scarf) and allies from Call ’em Out hold Blackinaw Island rally May 31, 2014 to protest the white-out of Detroit. Hitchcock and the organization Call ‘em Out battled for years against the closure of 210 schools, two thirds of the district’s original number, tens of thousands of lay-offs of teachers and support staff, and the loss of 137,000 students, 74 percent of the 1994 enrollment of DPS. 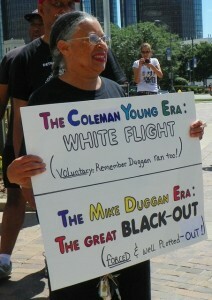 These actions began with the first state takeover in 1999 under Gov. John Engler (R), and were followed later by takeovers initiated by Gov. Jennifer Granholm (D) and Snyder (R). Wayne State University Professor of Education Thomas Pedroni posted the following comment on the Detroit Free Press website. “24 hours a week, $225,000 per year,” Pedroni, who has adamantly campaigned for the restoration of DPS, said. 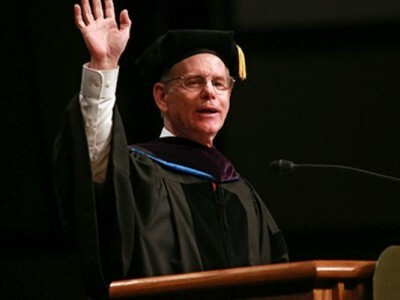 Prior to his appointment by conservative Sixth Circuit Court of Appeals former Chief Judge Alice Batchelder to handle the Detroit bankruptcy filing, Rhodes existed in virtual oblivion at the bottom rank of federal judges. He hails from the resort town of Cape May, N.J., where only five percent of the population is Black. 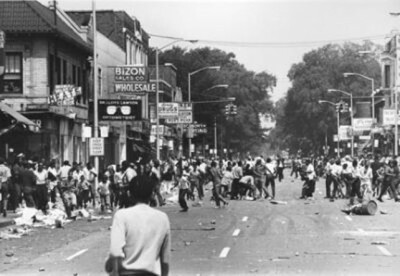 “Part of the decline of the city itself can be attributed to our unique racial circumstances,” Rhodes told the Detroit Free Press about the bankruptcy. “However, the concept of civil unrest or civil disobedience [in response to bankruptcy cuts] was not really on my mind.” But when Pastor Bill Wylie-Kellerman rose during a hearing to tell Jones Day attorneys, “You are not the City of Detroit,” Rhodes ignominiously ran off the bench to hide. The only other Chapter 9 bankruptcy Rhodes had handled was the 1992 case of “Addison Community Hospital Authority,” in which he barred the “Concerned Citizens for Addison Community Hospital” from intervening as a group. Addison, located just south of Jackson, MI, has a population of only 605 according to the 2010 U.S. Census. EM/Ch9 forum Oct. 10, 2012: (l to r) Frederick Headen, Edward Plawecki, Rhodes, Douglas Bernstein, Judy O’Neill, Charles Moore. Its participants were veterans of the battle to enact Michigan’s Emergency Manager Act, including Frederick Headen of the state Treasurer’s office, who has helped bring about numerous state takeovers during his tenure, Douglas Bernstein and Judy O’Neill, both of whom acted as trainers for emergency managers, with O’Neill helping draft Public Act 4, the predecessor to the current EM Act 436. Most astonishingly, Charles Moore of Conway McKenzie spoke, and went on to become one of the chief witnesses for Orr during bankruptcy proceedings. Protester carries a sign vs. removal of Blacks from Detroit, March 7, 2016. Rhodes rejected this reporter/retiree’s request to recuse himself for this blatant conflict of interest. The mainstream media, which practically anointed Rhodes Pope of Detroit for his handling of the Detroit Chapter 9 bankruptcy declared by Snyder’s Emergency Manager Kevyn Orr in 2013, predictably celebrated Rhodes’ return. Detroit Free Press columnist Rochelle Riley called for Rhodes to deep-six what is left of DPS, despite his claims that he wants to increase enrollment. 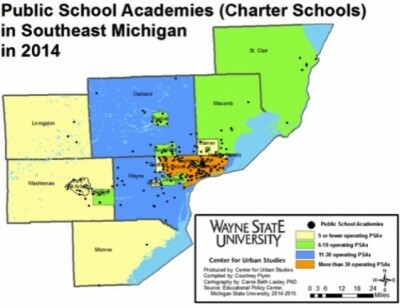 A recent study by Wayne State University’s Center for Urban Studies showed that Detroit is the state’s capital of charter schools. As a Black-majority city, it has been targeted just as New Orleans was, by the state’s charter schools, 70 percent of which operate for profit, not for the children. 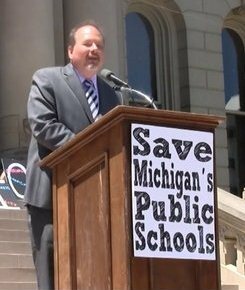 Despite the fact that 59 percent of Detroit’s children live in poverty and are now being consigned to a school district whose primary purpose will be to pay off DPS debt, the teachers’ union, minus its ousted but duly elected militant president Steve Conn, hailed Rhodes’ appointment. “The Detroit Federation of Teachers will continue to fight for a locally elected and empowered school board, and it is our sincere hope that Judge Rhodes’ transitional leadership moves us closer to that goal and away from the failed emergency manager system,” the union said in a statement. Ironically, Detroit teachers had just shut down most of the district’s schools in January, calling in sick to protest deplorable conditions. They did not cite as the chief cause of those conditions the loss of most of the system’s revenues to debt service since the first state takeover of 1999 under Michigan Gov. John Engler (R) and Detroit Mayor Dennis Archer, followed by more takeovers under Governors Jennifer Granholm (D), and Snyder (R). “I think the governor is doing his part to pay off Rhodes for the illegal bankruptcy he and Jones Day carried out against Detroit,” Bill Davis, president of the Detroit Active and Retired Employees Association (DAREA), said. DAREA has appealed Rhodes’ bankruptcy confirmation to the Sixth Circuit Court of Appeals, which now has a new Black Chief Judge, R. Guy Cole, Jr.
Bill Davis, president of the Detroit Active and Retired Employees Association (DAREA). 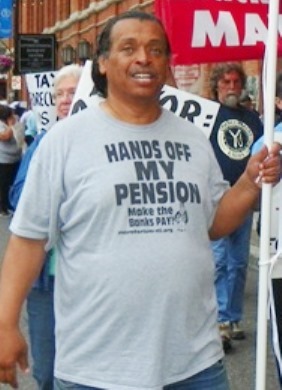 Davis referred to Detroit Mayor Mike Duggan’s revelation during his State of the City address that bankruptcy consultants including Jones Day, Orr’s former law firm, used outdated mortality tables in their proposed plan of confirmation that left Detroit with a $491 million pension fund shortfall. “How did we pay (bankruptcy consultants) $177 million for work they did and once they’re out of town they leave a $491 million hole a few months later?” Duggan said. Voice of Detroit has exposed the criminal nature of Detroit’s bankruptcy filing in numerous articles. It left the city in a shambles. Detroit now owes three times its original debt, has lost most of its major assets including the Detroit Water and Sewerage Department (DWSD), now operating in a temporary six-month “partnership” with the Great Lakes Water Authority. 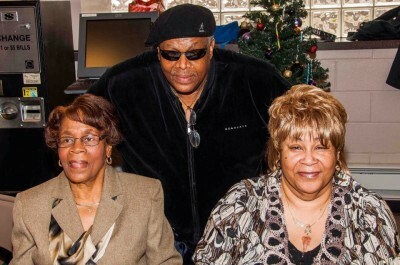 DAREA corresponding secretary Belinda Myers-Florence with mother and husband Jesse Florence, a D-DOT retiree. Mrs. Florence passed away in Nov. 2015 after working tirelessly against the bankruptcy. She and her husband lost huge portions of their pensions and health benefits. In the process, thousands of city workers have lost their jobs, further diminishing the city’s tax base as well as that of DPS. Due to drastic cuts in retiree pensions, individual savings accounts, and health care provision, many retirees have fallen below the poverty level. Not only are the wealthy elite who run this country determined to drive Detroit retirees to early deaths by cutting their income and benefits, they want to consign them to paupers’ graves. This entry was posted in Uncategorized and tagged BaxtersBeatBacktheBulliesBrigade, blacklivesmatter, blacklivesmatterDetroit, BlackStudentsMatter, DetroitPublicSchools, JailSnyderRhodesOrr, MoneyforSchoolsnotforBanks, SaveDetroit, SaveOurDetroitChildren, SaveOurSchools, StandUpNow, StoptheWaronBlackAmerica. Bookmark the permalink.